Samples were submitted for sequencing to the University of Washington HTGU, two times from each direction using vector M13F/R primers. See Sequence Log for plate layout. Selected 10 colonies (1-8, 18, 28) for mini-preps. Inoculated 5mL 1x LB + 50ug/mL of Kanamycin. Incubated O/N, 37C, 200RPM. 3mL of each culture were used for mini-preps. Used Qiagen kit. Samples were eluted w/30uL of EB. Positive controls for both primers set were also run. The positive control template was the purified PCR product from 20111006. Ladder is Hyperladder II (Bioline). Samples are loaded, left to right, as PGS1 and PGS2 on each colony (e.g. on the bottom gel image, under the “Colony 40″ label is the PGS1 rxn on the left and the PGS2 rxn on the right). Nearly every colony exhibits amplification using both primer sets, w/the PGS1 reaction producing a band of ~250bp and the PGS2 reaction producing a band of ~750bp. Colonies 18 and 28 are an exception to this and produced no band with the PGS2 primer set. NTCs were clean. The positive controls worked as expected, yielding a band of ~250bp for PGS1 and a band of ~250bp for PGS2. It is confusing as to why the size of the PGS2 positive control is different than the product that was generated from the colony PCRs. Will select 10 colonies for mini-preps. Cloned the purified “qPCR Fragment” from 20111006 using the TOPO TA Cloning Kit (Invitrogen). Performed a half reaction (total volume = 3uL), using 1uL of purified PCR product. Incubated at RT for 20mins and then placed reaction on ice. Transformed chemically competent TOP 10 cells (Invitrogen) and heat shocked at 42C for 30s. Added 250uL of RT S.O.C. medium and incubated at 37C, 200RPM. Plated cells on pre-warmed Kan50+X-Gal plates (plates from 20110726; X-Gal added ~30mins before plating cells). Incubated plates O/N, 37C. Good number of white colonies (>30). Will screen each colony with both qPCR primer sets to see if we can differentiate between the two COX/PGS isoforms in these clones. Ran PCR using primers Cg_COX1/2_qPCR_F, Cg_COX1_qPCR_R, Cg_COX2_454align1_R (SR IDs: 1192, 1191, 1190; respectively). Template was pooled cDNA from 20110311 of various C.gigas tissues. These reactions will verify (sort of) if we have both isoforms present in the PCR performed earlier today, prior to cloning. Master mix calcs and cycling params are here. NTCs are clean for both primer sets. We see bands of the expected size for both primer sets. Additionally, we see lower expression in COX2/PGS2, as we observed in our previous qPCR reactions with these primer sets. Will clone the large fragment that was PCR’ed/purified from earlier today. Ran PCR using primers Cg_COX_982_F and Cg_COX_2138_R (SR IDs: 1149 & 1151, respectively). Template was pooled cDNA from 20110311 of various C.gigas tissues. These primers anneal 5′ and 3′ of where the qPCR primers for both COX1/PGS1 and COX2/PGS2 anneal. Master mix calcs and cycling params are here. Ran multiples of the same reaction to ensure sufficient product for use in cloning/PCR. Gel is loaded with Hyperladder I (Bioline) and 7 samples (no NTC; don’t ask). Band in each lane is of the expected size (~1200bp). Each band was excised and purified using Ultra-free DA columns (Millipore), according to protocol. Purified DNA will be used in a subsequent PCR using the qPCR primers for COX/PGS 1&2 BEFORE cloning this product for sequencing. Performed an EtOH on gel-purified PCR products from 20110921. Briefly, added 0.1 vols of 3M sodium acetate (pH=5.2; 43uL), mixed and then added 2.5 vols of 100% EtOH (1182.5uL). Mixed, split into two tubes (due to high volume not fitting in a single tube) and incubated @ -80C O/N. Pelleted DNA 16,000g, 20mins, 4C. Discarded supe. Washed pellet w/ 1mL 70% EtOH. Pelleted DNA 16,000g, 15mins, 4C. Discarded supe. Resuspended both pellets in a TOTAL of 25uL Qiagen Buffer EB (10mM Tris-HCl) and spec’d. Now have sufficient DNA for sequencing. 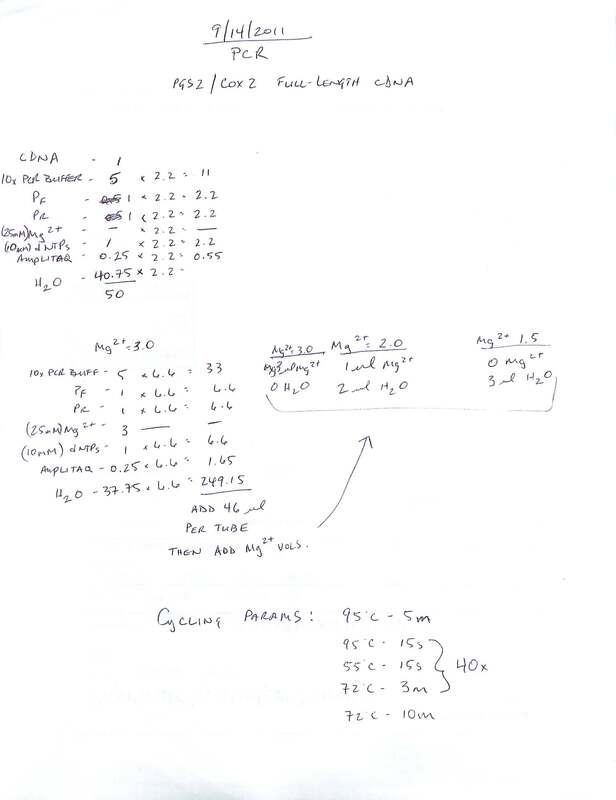 Generate PCR product using primers that anneal OUTSIDE of each of the qPCR primers and then sequence those bands to ensure that the qPCR primers are actually annealing to two different isoforms. Still have insufficient quantities of DNA for sequencing. Master mix calcs and cycling params are here. 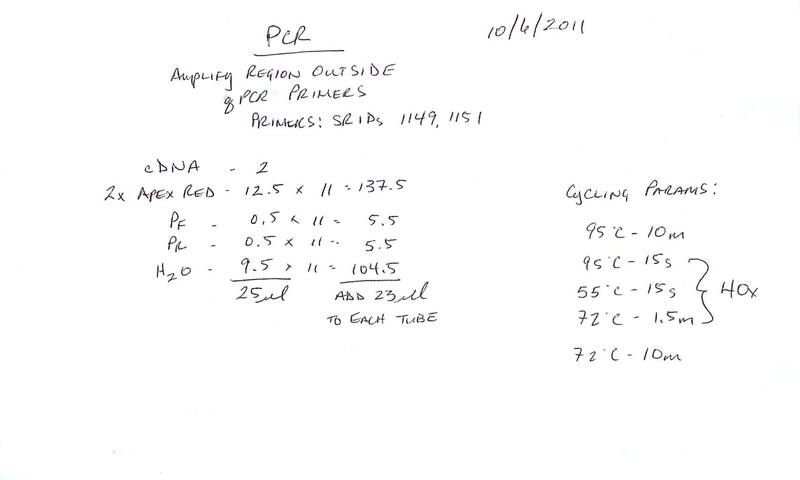 Additionally, used some of the purified PCR product as template in one of the reactions, just for comparison purposes. cDNA template was pooled cDNA from 20110311 from various C.gigas tissues. Also, increased the amount of template 4-fold in an attempt to obtain higher yields of PCR products for sequencing. Bands were excised and will be purified using Ultra-free DA columns (Millipore). Also, it’s very clear that using the purified PCR product as template produced a much greater yield, although there appear to be some spurious, high-molecular weight banding/smearing. Need more PCR product for sequencing. Repeated reaction from 20110825. Bands from lanes 2 – 4 were excised and purified with Ultra-free DA columns (Millipore) and spec’d. Concentration was extremely low (3.5ng/uL) and too dilute for sequencing. Will EtOH precipitate. 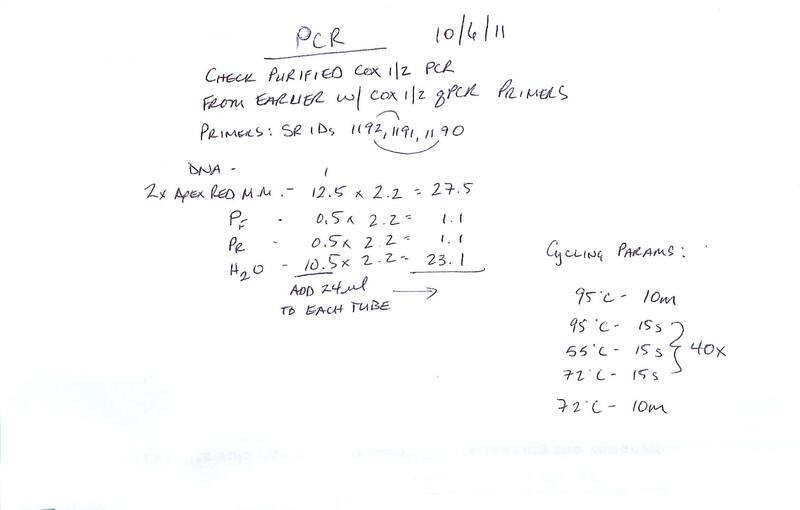 Repeated PCR from 20110825 to attempt to amplify the full-length cDNA for PGS2 (COX2), however this time using a more robust polymerase (Amplitaq Gold) in hopes of getting results. Additionally, tried 3 different Mg2+ concentrations (1.5mM, 2.0mM, and 3.0mM). Master mix calcs and cycling params are here. cDNA was pooled cDNA made 20110311 from various tissues. PGS2 primers = 1376, 1375.